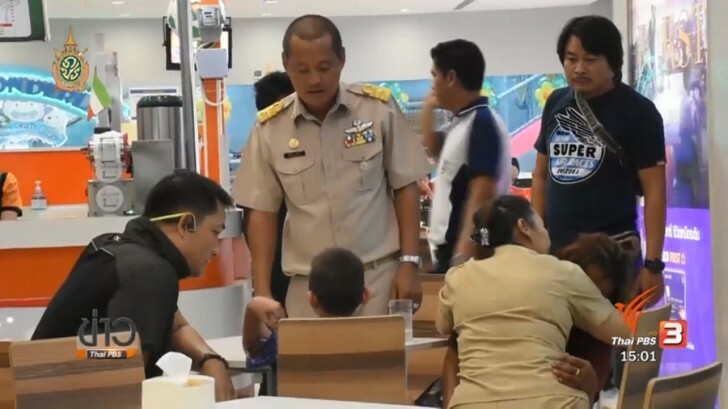 A hostage-taking drama took place at Tesco Lotus modern trade store in Chanthaburi Thursday morning when an apparently desperate woman pointed a knife at her own grandson after she could not buy him a tablet. The 45-year old street sweeper, Mrs Pooky as she was known, took her 8-year old grandson to the store at the latter’s insistence on her to buy him a tablet. However, she could not afford the tablet as the boy kept persisting. Out of a sudden, the woman took the boy to the kitchenware section where she grabbed a knife and pointed at the boy’s neck. The incident caused a scare among many morning shoppers who started gathering to find out what was happening. Then someone alerted the police who arrived shortly afterward followed by the Tha Chang mayor Mr Chalermpol Sakkham. The mayor spent about 15 minutes talking to her and succeeded in convincing her to free the boy. He then took her to the canteen in the store for more talks until she agreed to hand over the knife to officials. After the drama was over, the mayor bought a tablet for the boy and took both the grandmother and the boy back to their home in Tambon Tha Chang, Muang district.